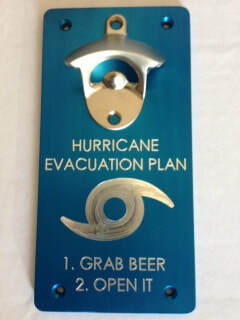 Highest Quality Metal Bottle Openers Available. Welcome to Daleism Bottle Openers! 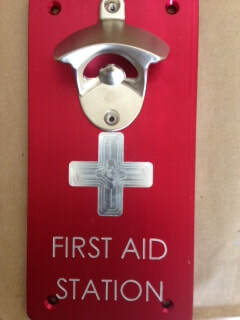 We manufacture high-quality mountable metal bottle openers that are perfect for indoor and outdoor use! If you are a beer-lover, then you will want one of these! Most mountable bottle openers that you will find are made almost entirely from wood, but that wasn't good enough for us! All of our bottle openers are made from a high quality aluminum base that is layered with anodized or power-coat paint that will never wear! This process allows us to produce the most durable openers available. All openers can be seamlessly mounted to any 4 in. by 4 in. post. The four holes on the corners of the opener base perfectly fit finish nails, so the mounting process is very simple. Every bottle opener features a distinct design that is engraved into the metal through the utilization of a heavy-duty CNC machine that is capable of making precise cuts. This is the same type of machine that is used by industrial assembly line companies, theme parks, and other large companies that heavily rely on metal parts. The original designs of many of the openers act as an artistic outlet and allow us to utilize our creativity to please our customers. Many designs reflect our love for beer, as well as sports and other topics. A small sample of our designs is available to look at over on the designs page, but we usually display over 300 unique openers at the events that we participate in, and are more than willing to take requests for custom designs. If you are interested in a custom design, go over to the "Contact Us" page and fill out a form to send an e-mail! 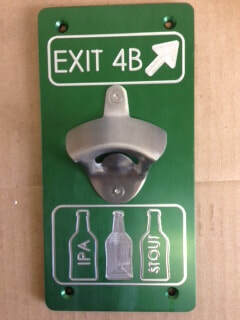 We pride ourselves in making the most authentic, durable, and appealing mountable bottle openers on the market.